I don't belong to a gym. Frankly, I'm just too cheap and I find that I can get just as good a workout at home with functional fitness, yoga, and running. TRX training has intrigued me though. Some of the ways you can work you muscles look very much like a functional training regimen. It looks pretty fun too. Back to the cheap thing. 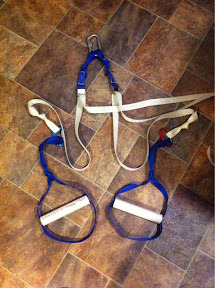 $150 for a set of TRX straps???? Seriously? Nothing a little research, some digging in my basement, $5 in hardware from Home Depot, and my tinkering engineer brain couldn't handle. May I present to you my home made DIY not pretty durtyfeets straps. I had a set of cheapo blue cam buckle straps (tie downs) from JobLot. I had some extra white 1inch webbing and I had the screw gate carabiner at the top of the picture. A trip to Home Depot for the 1in PVC, 2 little aluminum biners, and a screw eye was all I needed. The cam buckles are at the top attached to the screw gate biner to allow height adjustment. The handles and foot loops are made from the webbing I cut off the cam buckle straps. There are 2 square knots hidden inside the pvc to make the handles from a continuous piece of webbing. I had to fiddle around for about 20 min to get the loop heights correct but that was it. To attach the whole rig, I installed a 3/8 screw eye into a beam in my basement. That's it. If you had to buy all the materials, you are probably looking at less than $30. If you want me to get into more detail, let me know. I'm an engineer and a geek and March 14th is Pi Day. You know Pi=3.14 and March 14th = 3.14. In honor of Pi day, I skipped my rest day for a Pi Day run. 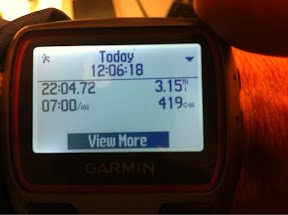 I ran Pi miles (stopped at 3.14 but the stupid Garmin rounded up) and it was a chilly 10*Pi degrees. I ran for 7*Pi minutes at a pace of 2.2*Pi min/mi. How about you, did you run on Pi day? Have you tried focusing on a wider stride or engaging your hip abductors? In case you hadn't already noticed, I'm a huge fan of Merrell Barefoot shoes. 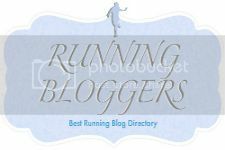 I was never really in love with the toes on my VFFs that started me on the barefoot/minimal journey in 2010 so I was immediately excited when I first read Jason Robillard's review of the first Trail Glove (link) and bought them as soon as they were available. My journey with the original Trail Glove started in January 2011 and those shoes were everything to me. They got me through my first half marathon, my first 6hr trail run, and my first 50K Ultra marathon. I used them on roads and trails. You can read my review of the original here (link). When Merrell approached me to review the Trail Glove 2.0 and Pace Glove 2.0, I was really excited and a little nervous. First off, this would be first time I had been able to try a shoe prior to public availability. That was a big deal for me as a blogger. Second, I was worried that Merrell might have changed what I consider to be a pretty damn fine shoe. I'm happy to report that Merrell did a wonderful job of updating the Trail Glove and Pace Glove without dramatically changing it. OK. I wasn't really in doubt since Merrell's product development team gets it when it comes to minimal shoe design. your foot on varying terrain. My Take: I didn't really notice a difference here but then again, I was happy with the original protection. That said, more flex is not a bad thing in my book. an even greater “barefoot” experience. We used all seamless materials for a soft natural feel on the foot. My Take: The upper is certainly more minimal. This is a good thing from a weight perspective and I don't think it will negatively impact the durability at all. Note: the Pace Glove 2.0 did not appear to have the new upper. mimicked the women’s for the 2.0 and went to 2. This helps open it up for an easier on-and off, and also allows the foot to splay more. We heard that the bottom 2 closures were putting pressure on the top of the foot and we corrected this for a more natural fit and feel, while still maintaining excellent foot hold on the instep. My Take: First off, I love me some OMNIFIT lacing. This is my favorite feature of the original outside of the obvious minimal features. Since the bottom closures never bothered me, I was a little worried that this would be a change for the bad. I'm happy to report that I do not notice a fit difference. The two top OMNIFIT laces do a fine job of locking your foot into place. conversation. Working with our advocates and athletes we learned that our arch is providing a great foot hold, and hugs up under the arch, without hindering the natural movement of the foot, so we kept the best selling trail glove fit and feel in the arch area. We feel this platform is right for the activity, as it moves well with the foot, hugs tightly, and allows the wearer to have excellent connection to the trail, and the right amount of grip and protection. My take: I was never really bothered by the arch on the original Trail Glove and I was not bothered by it on the Trail Glove 2.0. After putting a ton of miles on the Road Glove 2, which has a more noticeable arch, I was pleasantly surprised at how invisible the arch on the Trail Glove 2.0 was. @durtyfeets also had the opportunity to review the Pace Glove 2.0 but since I have anything but dainty womanly feet, I enlisted my favorite female shoe tester to give them a workout. The Pace Glove 2.0 (Women's) is quite similar to the Pace Glove 1.0 in that it already had the two OMNIFIT laces and the upper material does not appear to have changed. It seems like the only substantial change was to the heel design. Where the original Pace Glove had an elastic in the heel, the Pace Glove 2.0 employs a more standard solid design with a slightly padded heel collar. I would expect that this will create a more sockless friendly fit. Since it is winter in New England, my lovely and talented female shoe tester (a.k.a. my wife, Pam) did not test the shoe without socks. In general, she was fairly pleased with the Pace Glove 2.0. Insole on the Pace Glove 2.0 is really cool. Unfolded laundry and baby doll in the picture are not so cool. Her one comment was that it seemed like it fit a little larger than the originals. This may be due to the heel change. Prospective Pace Glove 2.0 buyers should definitely try them on to get the size correct. The durtyfeets conclusion: The Trail Glove 2.0 and Pace Glove 2.0 appear to have been updated mostly to bring the design aesthetic in line with the newer Merrell Barefoot and M-Connect shoes. All in all, Merrell did a fine job of NOT messing with an already fine shoe. If you are in the market for a minimal trail shoe, you can't go wrong here. Trail Glove 2.0 and Pace Glove 2.0 should be available through Merrell and REI in mid March.